Crop + fray might sound like a dance move but we’re actually talking about cropped + frayed denim and tips on shoe styling with this look (don’t mind the blurry mirror-selfie photos, whoops). But seriously, this frayed style started popping up last year and I think it’s going to be a staple for spring/summer 17! 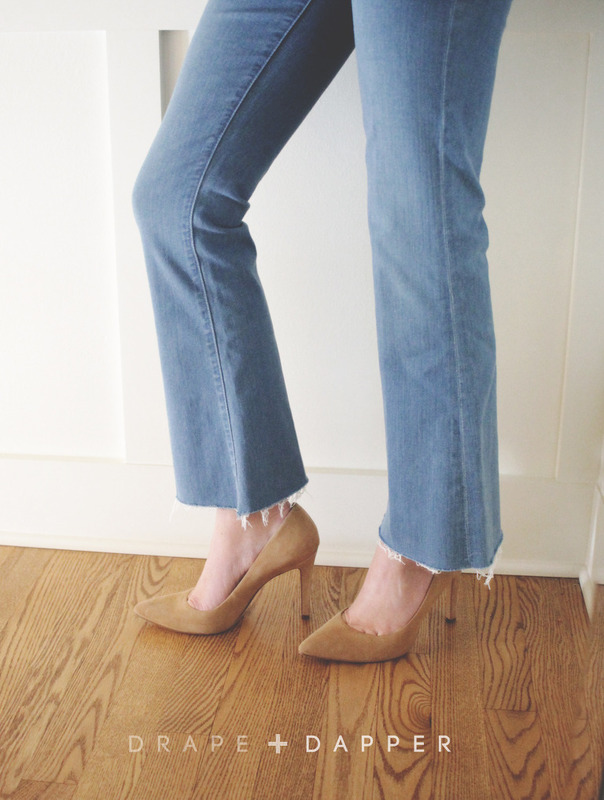 I bought a few pairs of denim that was pre-cut and I have also created a few pairs myself (we’ve included a little DIY at the end for those of you that are fearless with the shears). After owning these for a while, styling them has become less tricky. A few things to remember when buying pre-made or DIY denim. 1. Make sure the length is above the ankle bone, even an inch or so above looks good if its a flare or straight leg style. 2. Go for high-waisted varieties. They lengthen the leg and balance the cropped style. 3. When dressing up; minimalist heels with ankle straps, classic pumps and mid-calf booties that are fitted around the ankle look best. Again, it’s all about balancing the wider/cropped silhouette. 4. Don’t be afraid to dress these down. Pointy-toe flats, loafers and sneakers look super cute. Just make sure the length is short enough that it shows your ankles and doesn’t make you look like you’re wearing high-waters. 5. If the flare or wide leg styles aren’t your jam, opt for a straight leg or even slightly tapered. 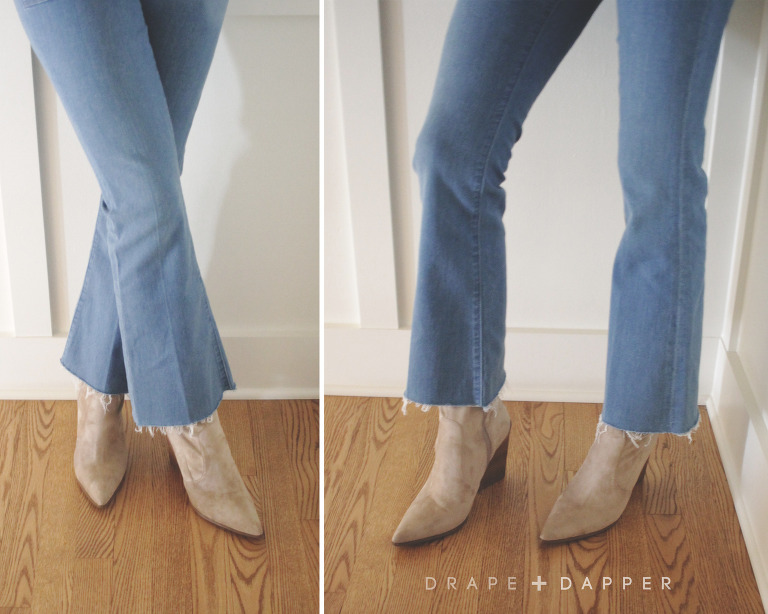 Here’s a DIY for the stepped frayed look: A few things to keep in mind: Measure twice, cut once! 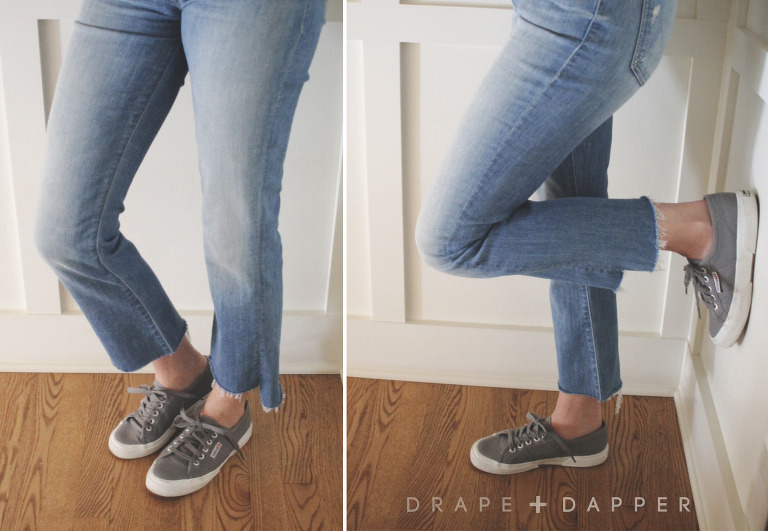 The jeans in the photo are a ‘stove-pipe’ leg style, which means they taper but they aren’t as fitted at the ankles as true ‘skinny’ jeans are. If you’re new to the idea of wearing cropped frays, this is probably a good style to start with. Don’t be afraid to cut off old denim or even a new pair that is too long – it saves on tailoring and is more on trend. 1. Cut the hem off, all the way across (like shown on left) just at the top of your ankle bones (remember these will shorten when frayed). If you don’t want the stepped look, skip step 2. 2. Measure 1/2″ up and cut along the seams on the front side to remove the strip and create a stepped look. 3. You can use sand paper or something abrasive to rough-up the edges and get the denim to start fraying. I just usually throw them in the washer and dryer and that does the trick. Hope you enjoyed our first post after a little hiatus, more to come!